In a most recent trip to Bali, I made it chief objective to get my hands on some babi guling (roast whole pig). Ironic since I’m not that big of a lechon fan. But since every guide and Bali-blog seemed to have mentioned, if not unanimously raved about it, I decided to pursue this pig in hopes of enlightenment. I tell our driver/guide we wanted to go to Ibu Oka and I saw a spark in his eyeballs. His mouth watered as he explained how Ibu Oka was considered the benchmark of babi guling. Tourists and locals alike come up in literal droves from the time it opens around 11am till all the pigs roasted for the day, generally a handful, are devoured. You’re lucky if they’re still serving by 2pm. From the shorelines of Seminyak, an hour and a half leisurely road trip upcountry to Ubud was taken, carefully planned so as to hit the place right before noon. The atmosphere was quite frantic upon arrival. A van full of Japanese tourists arrived amidst the already spilling establishment. 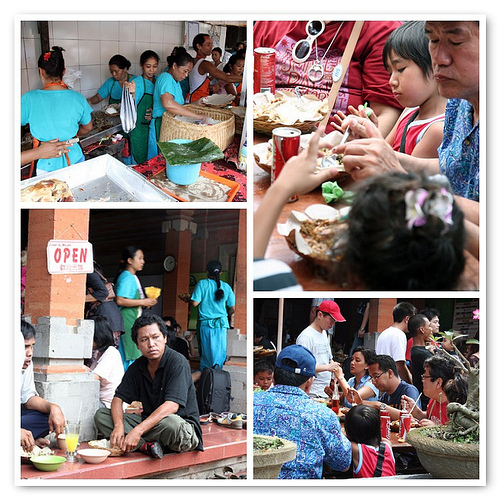 Hungry families waited as the frenzied staff prepared orders production line style. Servers skillfully tiptoed over denizens with several plates in hand. Some people were literally eating on the floor. What restaurant owners would give to have a “regular” day such as this. We get a front row seat near the action at the counter. Our orders come relatively quick; served on woven rattan chargers lined with waxed paper. The pigs, prepped with a secret mix of herbs and spices at the crack of dawn, are spit roasted to perfection. The evenly blistered skin incredibly crisp, and the meat indescribably succulent. A “regular” serving is composed of a generous portion of the crackling and flesh, piled over steaming white rice, with sides of equally crunchy innards (chicharon bituka), blood sausage and the token vegetable dish (containing kalachuchi leaves, as the guide tells us. Or there may have been communication breakdown somewhere but it did taste like it). 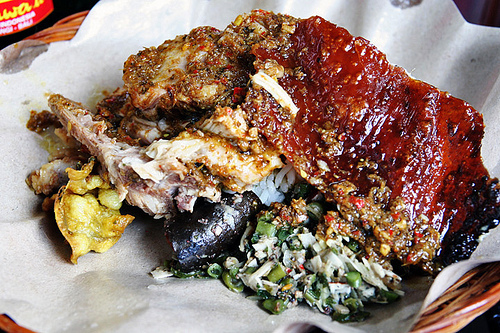 All doused with their signature fiery sambal that cut through all the grease. It was not so much as the excellent pig in itself but the way it was served that did it for me. There was just the right amount of different elements resulting in a perfectly balanced meal. (Tears are welling up my eyes as I write this.) The bill per plate came out to about IDR36,000 (P175) including an ice-cold bottle of Teh Botol; definitely a small price to pay for pig nirvana. Oh my! This looks and sounds awesome! Looks awesome, and Bali is already on my short-term "travel to" list.